For some people, reaching the height of luxury comes with the ultimate relaxation in the most private room in the house: the bathroom. The bathroom is where we go to get away; relieve stress by singing in the shower or lighting some candles and filling up the tub. 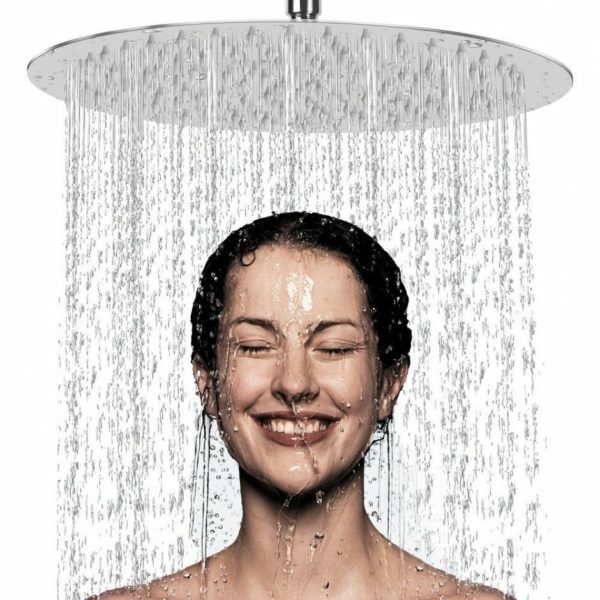 What better way to attain that sense of peacefulness than with a luxurious rain showerhead? Average showerheads are great, but rain showerheads deliver a full spectrum of pressurized water that starts your day off in the best possible way—or ends your nights in full-fledged relaxation. If you’re looking to install a rain showerhead, but aren’t quite sure where to start, take a look at this guide along with some top-notch product selections to wrap it all up. You can always stand to learn more, and a few suggestions are always helpful! 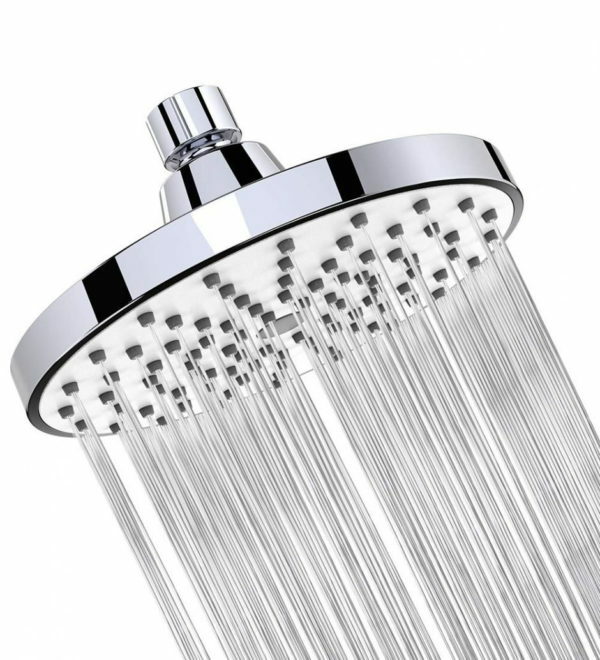 What are the Benefits of Rain Showerheads? It’s easy to say that rain showerheads are luxurious and relaxing, but what makes them so much better than typical showerhead? What’s the point in going through the trouble of installing a new showerhead when the one you have works perfectly fine? For one, since rain showerheads tend to be a little more expensive and luxurious, they are typically well-made with great features. These kinds of showerheads are easy to clean and clog-resistant, which is only fair; if you’re going to spend extra money, you should be able to use the product without worrying about excessive cleaning and maintenance. With rain showerheads, you’re also likely to get a beautiful finish like chrome or brushed nickel. Functionality-wise, rain showerheads are multifaceted. These fancy devices usually come with multiple spray settings, letting you customize your shower experience. While some like a hard jet, others prefer a softer setting. With a rain showerhead, you don’t have to choose. In fact, rain showerheads are the best option for a drenching experience. Since they mimic rainfall, these showerheads give users excellent water flow with the best pressure. People love that these products offer total body coverage, rather than average showerheads that are more centralized and don’t reach every spot at once. There are a few key differences to take note of regarding rain showerheads. If you’re planning on making the switch, you should be aware of everything that will change. Even if you’re happy with the changes, it’s still nice to know ahead of time. You rain showerhead will certainly be larger than your average showerhead. These products tend to be wider so that when they hang directly over you, you get the most coverage for your body. While this is certainly positive and is most likely one of your main goals, you will have to make sure that your shower area can accommodate the space needed. If your bathtub is too small, you’ll constantly have flooding, which can damage your floors and pose safety issues. You’ll also have to have enough room vertically so you can hang your showerhead with plenty of room left for you to stand under it without whacking your head. Take precautions and do some measurements before you choose your showerhead. The good news about rain showerhead is that it can still deliver good pressure. While it’s true that rain showerheads may not be as pressurized as normal showerheads, they still give you enough to clean your body properly. At the same time, many models will include a handheld option or adjustable settings so you can manage the water pressure and set it to your desired level for more control. Rain showerheads, as we discussed, are luxury products. Therefore, it shouldn’t be a surprise that they tend to cost more than typical showerheads. You should be aware of this fact in case price plays a large role in your decision-making process. If you can’t bring yourself to spend a little bit more money, then a rain showerhead might just not be for you. Rain showerheads come in a lot of different shapes, sizes, and styles. You can easily match them to fit your bathroom’s style as well as your own personal style. Luckily, you can install most rain showerheads right where your old showerhead was with little to no hassle. Simply unhook the old showerhead and screw in the new one. We recommend using plumber’s tape to reestablish a tight seal. As we mentioned earlier, be sure to take proper measurements before you purchase a showerhead and remove your old one. You just want to ensure that the showerhead will actually fit in your tub! There’s a good reason why rain showerheads are becoming more and more popular, and after reading through our information section, you might know a little more than you did before. Knowledge is power, especially when it comes to making the right decision on a home improvement purchase. Since you’re a little more informed on the subject, let’s go ahead and take a look at some of our favorite rain showerheads on the market. You know you’ve hit the peak of luxury when you’ve installed a 12-inch showerhead. This NearMoon Rain Showerhead is large, lightweight, and beautiful with a mirror-like surface that holds 153 self-cleaning nozzles. The ultra-thin showerhead weighs just about 2 pounds, and it’s super easy to install. In just five minutes, you could be standing under a wide circle of pressurized water. This showerhead uses special technology to optimize water pressure without using excess water. The design features air-in technology to boost pressure rather than sending more water through. At the same time, the specialized nozzles are cleaning themselves, making overall cleaning a breeze for you. 360-degree rotation lets you move your showerhead where you need it to be, all while maintaining full-body drenching. Available in a square option, you’ll have no problem matching this showerhead to your existing bathroom décor. The Lordead takes a 12-inch rain showerhead to the next level by maxing out the water flow with 196 water nozzles. Aside from these nozzles, which bring a rich downpour encompassing the entire body, air pressure technology gives this showerhead an extra boost without wasting water. Made from stainless steel, not only is this showerhead functional, but it’s appealing to the eye and will match any bathroom décor or design. The ultra-thin design maximizes your space and is lightweight, making it easier to install and presenting less stress on your bathroom wall. The nozzles are self-cleaning and give easy access to the surface for a quick wipe-down. The attachment piece is adjustable with a 360-degree range for free movement. At an excellent price, you can’t go wrong with this shiny new look. If a mere 12 inches isn’t large enough for your liking, perhaps you should consider something bigger—like the Alfi 16-inch rain showerhead. This showerhead is sure to accommodate anyone’s shower needs with its large, round circumference. Made from solid stainless steel with a brushed finish, this showerhead maintains excellent shine by resisting fingerprints and displaying a beautiful mirrored look. The nozzles are made of rubber, which makes cleaning super easy. At the same time, these nozzles are clear, allowing you to keep your shiny look undisturbed. With a swivel adapter, you can angle your showerhead to perfection. Smaller does not necessarily mean worse, and the Wassa Rain Showerhead certainly proves that point. This 6-inch rain showerhead delivers a spa-like experience just as larger showerheads do, but this one will fit in your smaller bathtubs. With 90 silicon jets, you get self-cleaning power that fights lime and hard water signs. This elegant product delivers strong pressure through its smaller head and connects to any standard shower arm. It’s easy to install, but you can also include expert setup in your purchase if you’re feeling unsure. Weighing just 10 ounces, this lightweight showerhead won’t weigh on your wall or shower arm. The chrome finish presents beautiful shine for a modern, clean look. With a swivel ball joint, you’re free to adjust as needed to enjoy the perfect shower. While some people may be content with just a new showerhead, others of us prefer to have the option of additional pressure and a little more control. This Pulse ShowerSpas Shower System makes that possible. The 8-inch rain showerhead delivers that luxurious waterfall feel that you’re looking for without sacrificing pressure completely. In addition to the rain showerhead, this system includes a handheld piece that lets you adjust your pressure and gain some control. The surface-mounted system is easy to replace and fits into your existing shower arm like other systems with the handheld attached. The clear rubber nozzles are easy to clean, and the handheld has five different functions. Additionally, adjust the height of your system easily with the brass slide bar. For your convenience, the system even features a brass wire soap dish. You can get this system in brushed nickel, oil-rubbed bronze, and polished chrome finishes to match your existing décor and style. If a modern, luxurious look is your style, the SR Sun Rise Luxury Rain Mixer Shower may be the right choice for you. 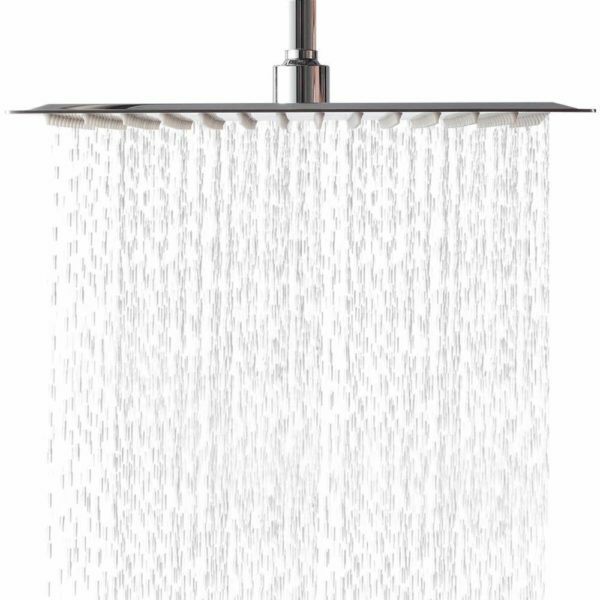 This shower system combines the drenching feel of a rain showerhead with a sleek handheld. The squared off shapes, and chrome design will make you feel like you’re living in a mansion. With a 10-inch rain showerhead, you’ll get excellent pressure through the air flow design. The stainless steel handheld lets you control water flow for hard to reach places. This system uses pressure balance to monitor the pressure levels. This ensures that you don’t get burned by sudden temperature changes and keeps you safe and comfortable. Made from 10 layers of chrome-plated finish, your showerhead will resist corrosion and rust, leaving you with years of quality use. The system is also available in a 12-inch head system for large surface area coverage. We’ve looked over a handful of really great rain showerheads, so it can be tough to pick a favorite. 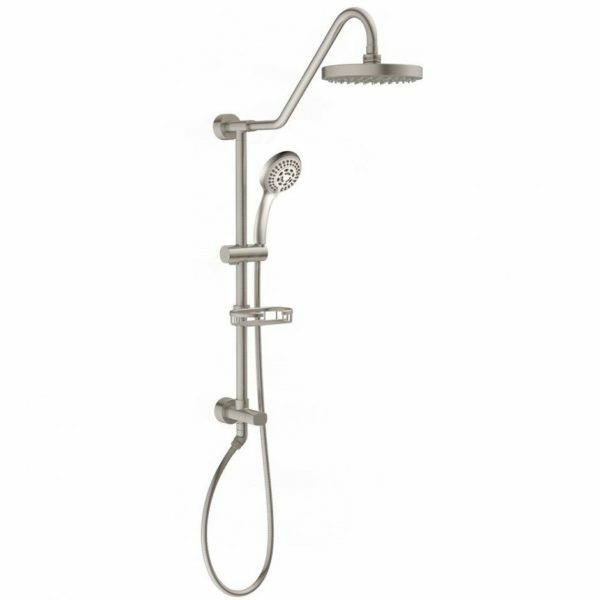 When it comes to looks, we really love the SR Sun Rise Luxury Rain Mixer Shower. It offers an extremely modern, sleek look that will brighten any dull bathroom and give it an instant boost. However, this system didn’t match up to the quality of the Pulse ShowerSpa Kauai III Shower System. 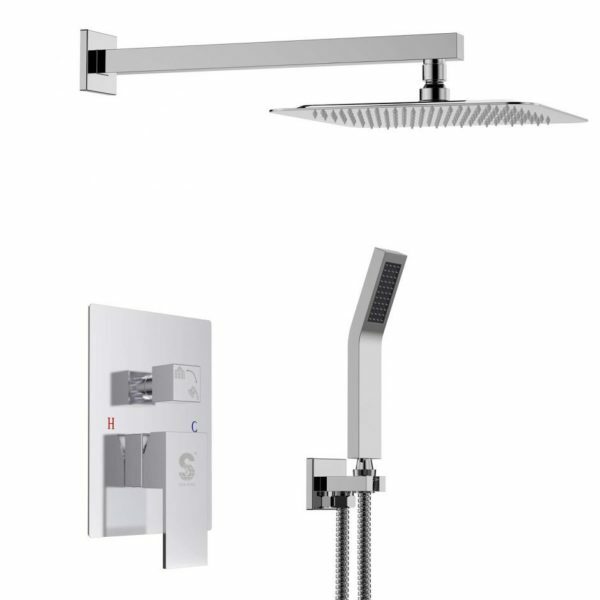 Although the showerhead is smaller, we love that the height is adjustable. With a handheld showerhead for tough to reach places, you can’t go wrong. Also different from the SR Sun Rise, this handheld has five different speed settings as well as three different finishes. Not only can you customize your look, but you can customize your water flow. Easy to install with clear directions and a very fair price, we love the Pulse system and highly recommend it to anyone who loves a good waterfall, but needs a little more pressure and control in their life. Take a look at all of these options further to make your decision on the best rain showerhead. You’ll be so happy you did when you’re standing in your own personal waterfall in the comfort of your own home.